EURJPY has been going north for more than two years and recently seems to have met some resistance at the high of June 1996. This chart, being monthly, does not show the swings as would a lower time frame chart, but it shows clearly the long term swings. 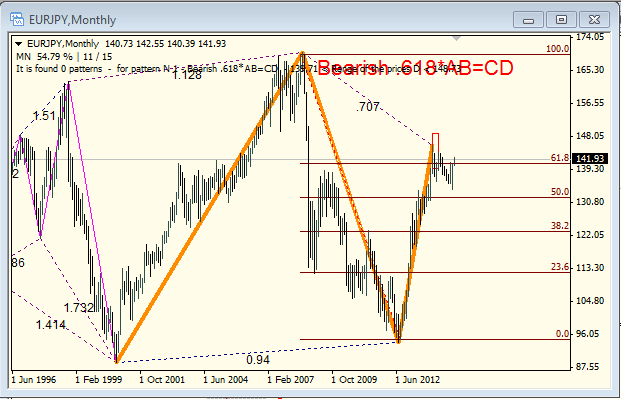 I think we can expect some bearish moves based on this Fibonacci Pattern showing a Bearish AB = CD and considering the EU economies at this time. There is no entry on this chart at present, that would have to be confirmed by price action, preferably using faster charts than monthly. This video is a very well done presentation regarding Harmonic Trading. It is lengthy but a good investment of time as it covers many aspects of the patterns in detail.